In medium skillet, cook pineapple slices and Canadian bacon over medium heat for 5 minutes or until thoroughly heated and lightly browned, turning once. Meanwhile, toast English muffin halves; spread with margarine. Place 4 halves on small ungreased cookie sheet. 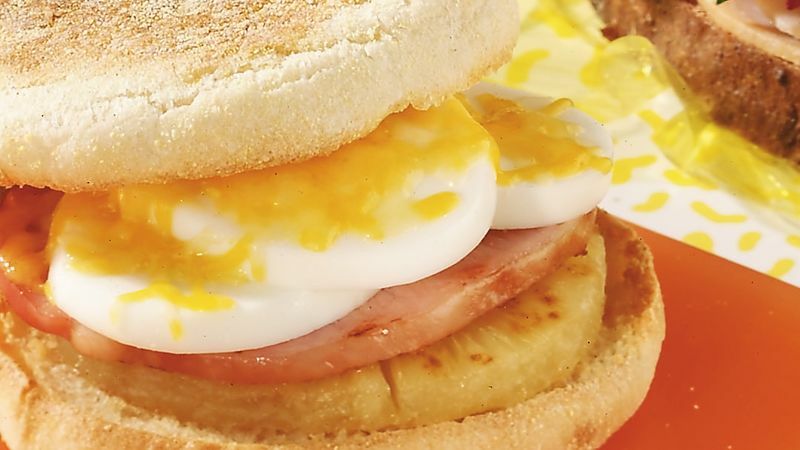 Place 1 pineapple slice and 1 Canadian bacon slice on each toasted muffin half. Top with hard-cooked egg slices and cheese. Broil 4 to 6 inches from heat for 3 to 4 minutes or until cheese is bubbly and sandwiches are thoroughly heated. Top with remaining muffin halves.